All New Adventures: What do gondolas, luges, lake cruises and a plane have in common? What do gondolas, luges, lake cruises and a plane have in common? Not much really except that we went on all of those things during the last 2 days of our brief little jaunt down the line. So yes, the last 2 days of our Queenstown holiday was a "touristy" type affair. It was a cold morning with low hanging cloud when we made our way to the Skyline gondola. Jef and Rob were doing the Bike Park, and Phillippa and I with the kids in tow went up to see the sights, and get some luge action. That low hanging cloud was persistant. So Kien and I definitely got some luge action. It was way way fun! Taking the lifts back up was nearly as much fun as going down. Unfortunately the luge was for persons 2 years and over, so this time Phillippa and little Emily couldn't partake. Jef took a photo of them partaking in exploring the surrounds instead. Then it was a cuddle for Daddy so he could go down the bike park again. Kien and I hung around up here for quite a while. 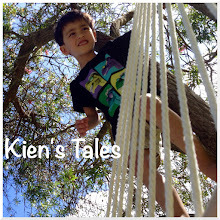 Kien would pose and I would take photos of him and the scenery. I love these types of signs telling us how far away we are to places. Then we tried to race Jef down - him on his bike and us in the gondola. Hi Daddy. Good to see you! We won, right? In the late afternoon we went to the Kiwi Birdlife Park so we could see these creatures getting fed. That was fun but for obvious reasons I have no photos to show you. There were also a bunch of other native birds we saw, most of which were very beautiful, and I took a few photos but it made me sad to see pictures of wild birds in cages so I haven't even processed them. We made our way to the waterfront for dinner. One thing we've noticed recently is how he's taken an interest in colouring in. So it's great that restaurant we go to have this available, and he happily sits there and scribbles for all of 5 minutes. The following day was our last in Queenstown, and it was overcast and foggy. After dropping our rental car off we went back to the waterfront and the next available cruise on the lake. Kien insisted on being inside, and then he got restless. So we quietened him down with some electronics. We hadn't realised that the cruise we took, called "Million Dollar Cruise" was not referring to million dollar views of the wilder side of Queenstown, but rather the expensive waterfront homes. It was fun nonetheless as the captain/entertainer told us some interesting facts about Queenstown, so it was relatively educational. Our flight home - I've ticked something else off my list of "must do in my lifetime" - I was fortunate enough to be able to catch a ride in the cockpit right behind the captain. Here he is doing the overhead transmission to the rest of the passengers on the plane. "This is the captain speaking..."
It was such an amazing experience. As we flew over regions he would point them out and tell me some facts. Besides the take off and landing, the other highlight was flying over Golden Bay and seeing the sandspit, then looking to the right and seeing Wellington, then seeing Mt Egmont and New Plymouth ahead of us. It was breathtaking. We had an awesome landing. I loved how the runway was right in front of us and then next minute we were down on it. Wow-wee, we were only away for 5 days but it felt like a true holiday, and I feel so rejuvenated and enthusiastic - so much so that I've booked us in to go back to Queenstown for the winter festival in June!